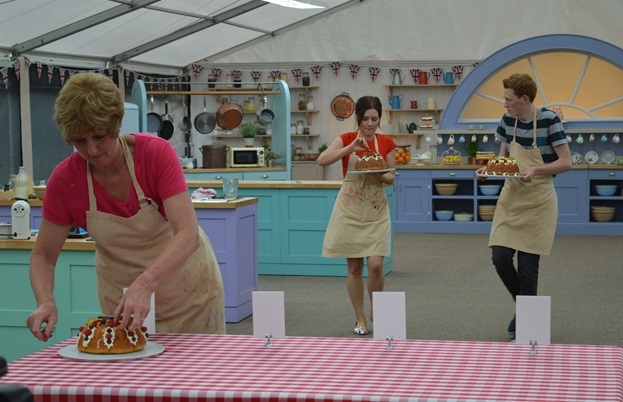 As four bakers become three, Howard Middleton takes us through the highlights of the semi-final, with a reinvigorated Mary, a strange technical challenge and Selasi in a dress. I have in my hand four beautiful bakers but only three of them are in the running to becoming Britain’s next Bake Off champion (with apologies to Tyra Banks). Ah yes – the Radio Times cover heralding next week’s finale has, for four years now, featured our final quartet with the bittersweet knowledge that only three will actually make it all the way. Andrew beams, Jane looks relieved, Candice smiles inscrutably and Selasi just looks cool – their expressions are not giving anything away. Mel and Sue produce a beautiful French-flavoured cinematic pastiche to herald la semaine de pâtisserie and we settle down to a puff pastry signature of twenty-four savoury palmiers. Selasi says he’s never made palmiers before, which is a slightly odd admission for a signature challenge. He goes on to say ‘it should be alright’. Well, he’s been right so far. Candice says she’s not worried – ‘they’ve been alright at home’ – but we all know that’s no guarantee; the tent does strange things, as Andrew demonstrates, bravely attempting to restore order to his unruly puff. It’s one of those dreadful moments in what’s known in TV parlance as ‘the royal tour’ – Paul and Mary swoop in on Andrew’s bench just as his butter chooses that very minute to lewdly expose itself. Admitting he’s losing confidence by the second, an hour into the challenge he decides to remake his pastry. 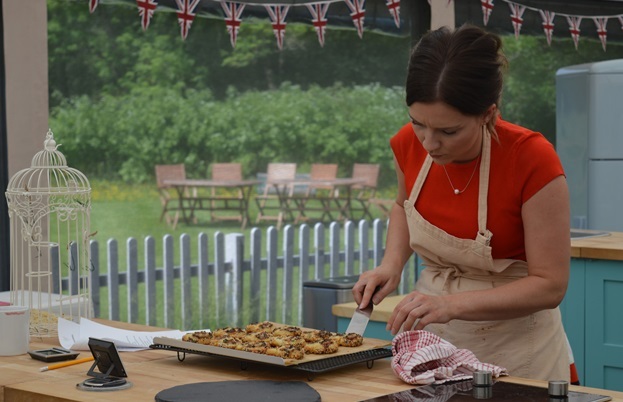 Jane tells us she hasn’t been sleeping – ‘I lie awake worrying about my bakes’. 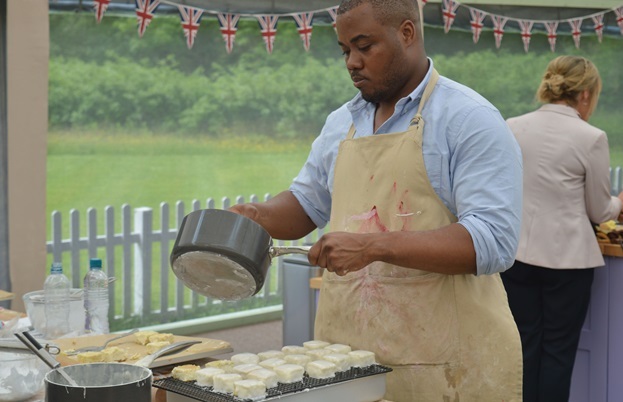 Selasi dreamed that he made it to the final but had to bake in a dress. For a semi-final, Mary is positively bristling with sharpness and energy. She either has some forewarning that she’s not enduring another season in this place, or it’s some serious HRT (Hollywood replacement therapy). Striding forth she asks Andrew, ‘When you say breadcrumbs, you mean fresh white breadcrumbs?’ ‘Yes,’ he replies, helpfully showing her the evidence in a jar. ‘No – those are raspings! Those are dried.’ If, like me, you didn’t know what raspings are, just watch, learn and cower as Andrew suffers the corrective rasp of Mary’s tongue. Step aside Judge Rinder – Judge Berry is in town. Jane admits her last practice batch of palmiers suffered a butter spillage and it’s butter fingers all round as she drops three on the oven door, then Selasi drops six of his. For the first time he admits he’s scared. Jane’s pesto and sun-dried tomato flowers aren’t quite done but have a good flavour. Her goat’s cheese, Kalamata olive and Parma ham elephant ears are also ‘a little bit soggy’ but they have a ‘perfect flavour’. Selasi’s salmon, spinach and chestnut mushroom elephant ears are even soggier but the flavours are good. His ingeniously shaped butterflies filled with piquanté peppers, Parmesan and poppy seeds have crispy wings but are practically raw in the middle. The technical challenge is a syrup-soaked savarin. It looks like one of Carmen Miranda’s more conservative hats – packed with tropical fruit, shards of caramel and a little oval-shaped chocolate plaque labelled ‘Savarin’ – similar to those 1970s door signs inscribed with ‘Tracy’s room’ or ‘Gents’. Mary thinks the warm conditions in the tent will work to the bakers’ advantage, encouraging a speedy rise to their yeasted savarins, but the heat seems to be getting to them. With typically vague instructions, the bakers can’t decide between a whisk or dough hook. 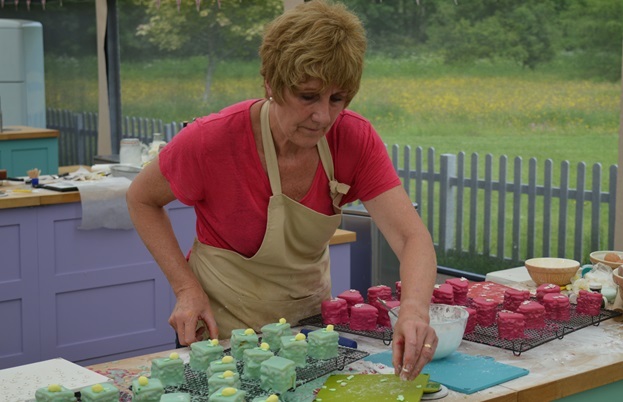 Jane despairs – ‘why is it everyone can make caramel and I can’t?’ – but she eventually cracks it with a few suitable shards and takes the top spot. Andrew and Candice show they could easily get jobs piping names on personalised Easter eggs and take second and third respectively. It’s not looking good for Selasi. For the semi-final showstopper it’s thirty-six fondant fancies in two flavours. 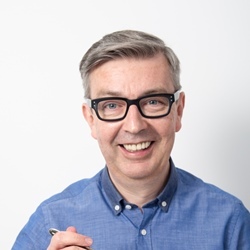 Paul says ‘I want to see shop standard’, though admittedly a retail sector that incorporates everything from Harrods to Poundland offers our bakers some scope. Mary’s still on her quest for ‘sheer perfection’ but she admits something so shocking I can hardly bring myself to repeat it. ‘In the real world, you’d make them the day before so the sponge is firmed up.’ What? 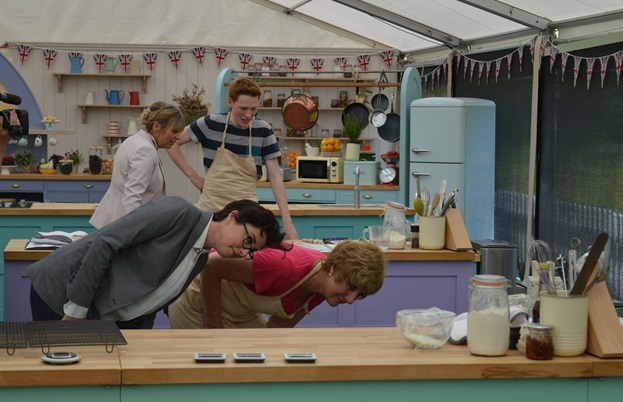 Bake Off isn’t the real world?! Sensible Jane brings us back down to earth with her clever device for dipping her fancies – a potato masher. The surprise in her lemon curd surprise cakes seems to be that they contain lemon curd. Jane looks stressed. She points out that spending five minutes on each fancy would eat up three hours so she’s cutting corners by not crumb coating her cakes. They’re left with the unfortunate appearance of cellulite under silk – not Mary’s idea of ‘sheer perfection’ – but the tasty raspberry-filled pistachio sponges are perfectly neat inside. Selasi never sifts his flour at home but isn’t prepared to risk more Berry scorn so he remakes his bright pink sponges, putting him behind with his lime and ginger fancies. Convinced he’s a ‘baking athlete’ and that his stamina will serve him well, once again he bravely claims ‘I’ll be alright’. Despite his marathon effort Mary’s still not impressed. She says she’s ‘not madly excited by the flavour’ of his pink velvet, raspberry and Prosecco cakes covered in white chocolate fondant. Paul agrees it’s ‘just sweetness with a great sponge inside’, preferring the tang of his lime variety. At the final countdown, Candice drops one cake on top of another and has to do some last minute repair work. Selasi seems resigned to his fate and Jane is at the end of her tether. Andrew despairs - ‘my fondant is just oozing’. Demonstrating her range for future TV work, Mary overdramatizes a few fruity specks on Andrew’s finished cakes, claiming ‘jam is pouring out’. Then she tastes Candice’s chocolate and praline cake and says ‘there’s nowt wrong with that’, vying for a guest appearance on Coronation Street… or Emmerdale – it’s a fairly non-descript northern accent. Candice’s chocolate Genoese with praline is judged to be beautifully soft and Mary sums things up by saying ‘they don’t look so brilliant but they’re stunning’. 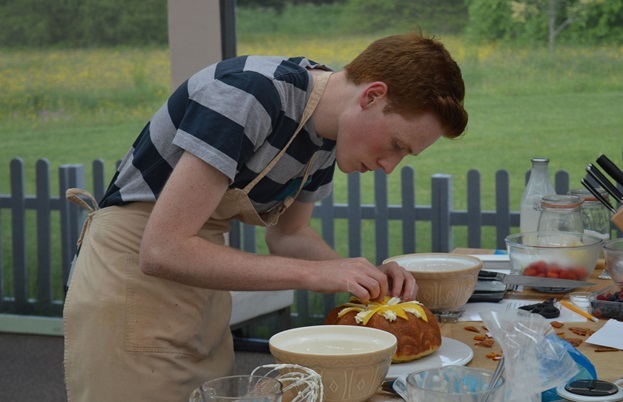 Andrew’s bow-tie-bedecked chocolate and Irish cream liqueur cakes are judged to be a little too buttery but his Victoria sponge-inspired raspberry and vanilla fancies topped with sugar paste sheet music are ‘excellent’. Mary is wowed by his presentation and he picks up this week’s Star Baker accolade. Selasi’s super cool persona really felt the heat this week and inevitably he is sent home. And so we’re left with an amiable trio to face the final challenges. I look again at the cover of the Radio Times and see if I can spot something in their eyes – a sparkle of victory, a glimmer of disappointment, or is it just the luxury of a good night’s sleep? I vividly remember my own Bake Off nightmare in which I desperately searched for a nutmeg tree to flavour Mary Berry’s hot milk. I wonder if Selasi still has that dream about baking in a dress.